This is one of those books that will make you break out in a sweat—hot, cold, who cares—but you absolutely must have dry hands to handle this book so as to avoid getting sticky fingerprints all over the glossy pages. If you have an excitable bone in your body, if you are even a little bit of a visual person, the photos in this book are eyeball-warping sensory overload. From their sheer size (open the book is 30″ wide) to their sharpness, the photos are so in-your-face you’ll end up wanting to hold the book at arm’s length. So there. You know how modern-day TV people complain about HD technology showing every blemish? Cutting-edge digital 1080p is one thing but printing is printing is printing. It simply defies common experience to see photos this well reproduced in an analog medium. Like the 359 Gmünd Coupe that is so unbelievably well photographed it shows every “pore,” ding and scrape in its matte aluminum skin. Most of the other cars look as if they have been poured onto the page in a liquid state. If book printing can do this, then what are all those other lumps crowding our bookshelves? That the cars look so good is all the more surprising when you consider the circumstances of the photo shoot. Photographer, Porsche racer and collector, and TV commercial-director Jeff Zwart (and crew) photographed these cars at Rennsport Reunion II (2004) at Daytona International Speedway in a makeshift studio set up in an empty garage. 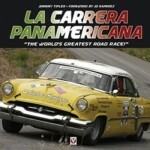 Over four days they shot 30 to 40 cars a day and had film processed well into the night. Considering that these cars were there to race—or at least be driven with a measure of vigor—they are eerily clean and shiny. 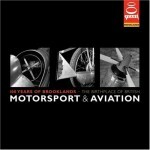 Each of the six chapters is introduced by brief comments from a factory driver of that period: Herbert Linge, Dan Gurney, Brian Redman, Derek Bell, Hurley Haywood, and Sascha Maassen. This is the only text in the entire book, save for data panels on the photos that list model, year, cylinders, and displacement. Even without text, Porsche aficionados will recognize individual cars easily enough by their liveries. 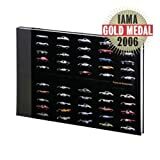 Each decade, preceded by one page of close-ups, shows the cars in chronological order but keeps model types together even if that disrupts the year order. The point here is to enable the viewer to compare the cars to each other—apples to apples as it were—and spot differences. 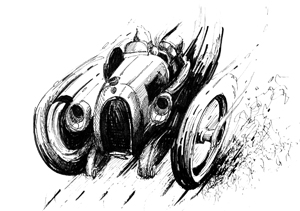 For the same reason all cars are shown in a uniform manner from two perspectives, front and profile. Many of the profiles go across a spread. The frontal views are lit in such a way that more light is cast onto the right side, leaving the left in some shadow. Since cars are pretty much symmetrical left to right this is a clever way of bringing out the sculptural aspects and illustrating how different one and the same car can look depending on the light. There are 222 “main” photographs and 144 small detail shots. 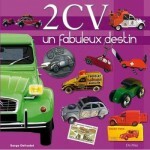 A final page shows various specials, including a Porsche tractor and a bicycle. Two cars—917 and 911—are accompanied by tipped-in engineering drawings on parchment paper. 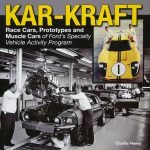 This book owes its existence to Zwart—playing hooky from a car commercial shoot—attending the inaugural Reunion (2001, Lime Rock) and forming the opinion that such a gathering of unusual cars should be recorded with pomp and circumstance. Sponsored by Porsche Cars North America and organized by Brian Redman’s Intercontinental Events, Inc., the Porsche Rennsport Reunion is held every three years. You’ll notice the appellation “definitive” in the title; always a problematic word. The Reunion is open to the public and aims to bring together significant vintage and current Porsche racecars and famous Porsche race drivers. But, you run what you brung, and what shows up is what you’ve got. 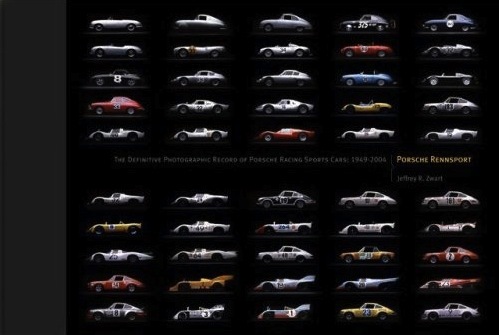 Despite these variables, the selection shown here is certainly representative of Porsche’s finest even if perhaps not “definitive” in a planned, curatorial sense. 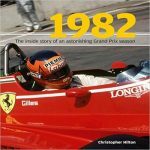 In terms of the “photographic record” this book is certainly living up to the expectations raised by such a lofty title and does constitute a definitive, benchmark-raising treatment of the cars. $150 is not pocket change but considering the superlative visual impact of the book and the enjoyment you will derive from it, the memory of the cost will quickly fade. Beg, borrow, (don’t steal!) to get this book while it is still in print—it won’t get any cheaper on the secondary market later on! The book is also available in a special publisher’s edition of 300 numbered copies signed by the author and the six drivers named above ($295). 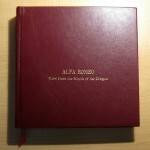 The first 50 copies are bound in garment-quality leather ($450). 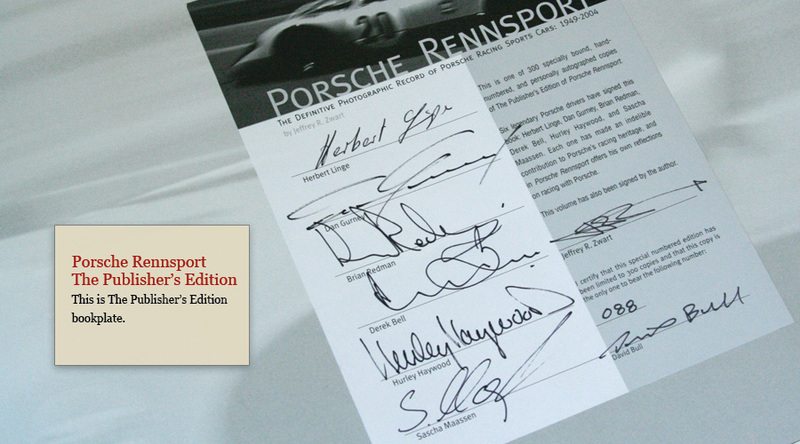 Thank you very much for your terrific review of the Rennsport book. You really delve into a book’s details and provide context and insight that allows the readers to really understand our intent and to “pick up what we’re putting down” (the colloquialism door was opened by your “run what you brung” reference, so I seized the opportunity to walk through myself). It’s such a pleasure to read an intelligent, truly informing review. You’re quite good at this stuff.